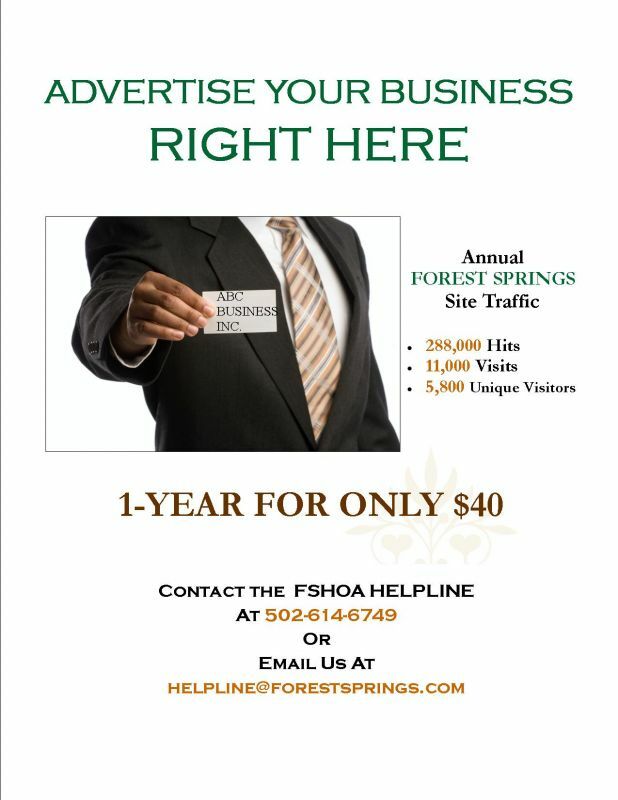 The Forest Springs community website was developed to serve as an informative resource for both our neighborhood and our local community. Please feel free to contact us with your comments and suggestions. MSD wants you to know that anyone in Louisville Metro can purchase flood insurance. Lenders require flood insurance for those inside the mapped floodplain. Those who live outside of these areas can still be at risk for flooding. The Code Red emergency notification system many of you used recently ceased providing communications to Louisville subscribers. Current subscribers of that system will need to register at www.smart911.com for the new emergency notification system called LENSAlert. In addition to receiving emergency notifications, individuals can use this web site to create a profile for themselves and their household to include any information they want first responders to know in the event of an emergency. When individuals make an emergency call, their safety profile is automatically displayed to the 911 call taker, allowing them to send the right responders to the right location with the right information. Information about medical history, allergies to medications, number of residents in the home, and even a picture of the family dog can be added to this profile. We all have heard the saying “Change your Clock Change your Battery”. Did you know that smoke detectors have an expiration date, the next time you change your battery on your detectors look for a date on the bottom of the detector. Most all detectors have a ten year recommendation for replacement. You probably know most thieves gain entry to your home through your front door. But, did you know the second most used method is through a first floor window? Almost 10%of thieves enter through the garage! LMPD's 8th Division has offered some tips to help you better protect your home from theft. Theft from vehicles is another area where citizens can make things harder for would-be criminals. Building a deck, planting a tree or putting up a fence? Before you dig for any reason, remember to always call 811. Calling 811 before you dig not only ensures you won't damage valuable electrical equipment but also keeps you from harm. Call 811 - its the law! Carbon Monoxide is a toxic gas, but, being colorless, odorless, tasteless, and non-irritating, it is very hard to detect. Carbon Monoxide is a product of incomplete combustion of gasoline, natural gas and propane or improper ventilation of these gases. Symptoms may include headaches and flu like effects; larger exposures can lead to significant toxicity of the central nervous system. (you may have trouble keeping your balance or walking). Prolonged exposure can even cause death. There is only one way to detect carbon monoxide and that is with a UL listed detector. There are several of these available to choose from at your local retail stores. The electric with battery backup and digital read out is one of the most preferred. For more information you can contact Captain Dave Dittmer at 502-245-7555 or ddittmer@mfpd.org. Did you know that it is a State law that all school systems must have fire drills? They conduct fire drills to ensure that every student knows a primary and a secondary route to exit the building. After exiting the building the teachers make sure that all of the students are accounted for.